Late one Saturday night, a fire broke out at a shop, consuming everything in it, including that once perfect machine and the memories it fostered, turning them into chard debris and unrecognizable rubble. There it sat, the iteration and wonder of intense labor, creativity, and painstaking effort. It was all at once beautiful and breathtaking; gleaming, seemingly perfect, an unquestionably powerful machine. It was ready, waiting patiently in a downtown Fresno, California garage for its unveiling, it’s chance to be seen, and gazed upon by the throngs who would come to admire its beauty and potential power. 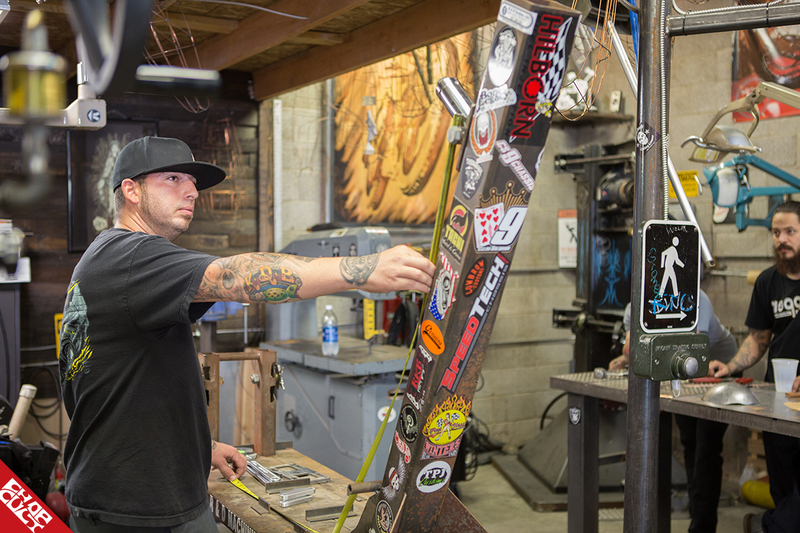 The shop was owned by the talented painter and tattoo artist many know as Kool Hand Luke. In his career, he has turned so many memories and items from his own life into amazingly impressive pieces of art. Luke has his own creative Kool Kulture style of art, his creations really stand out from the rest. 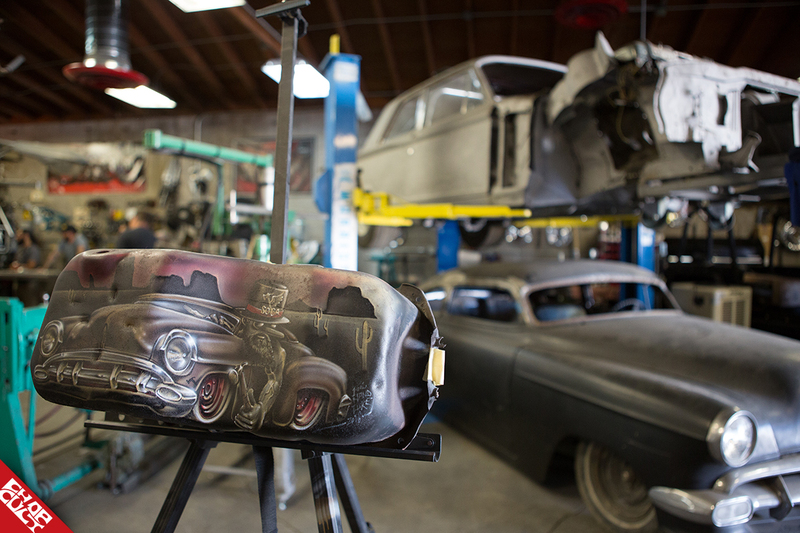 Luke’s shop contained cars, paintings, equipment, tools, and countless other pieces, reflecting his creative love and artistic dedication to the process. 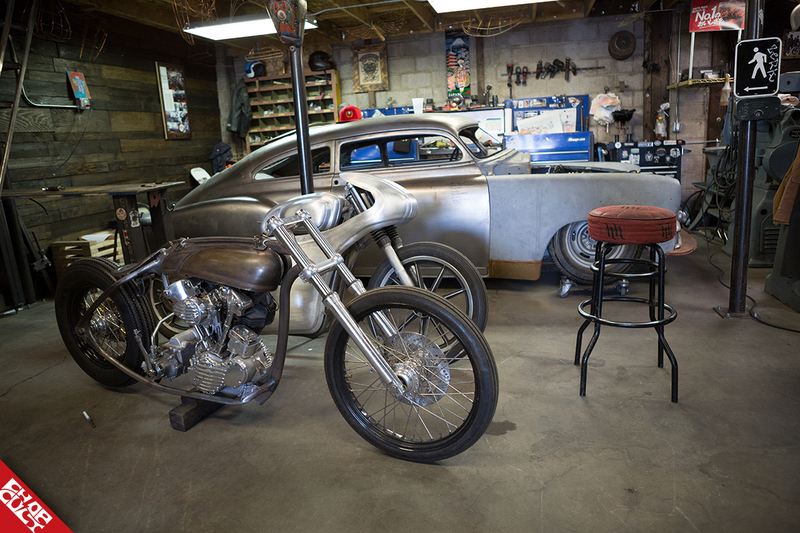 Among those pieces, Luke also housed in the garage two custom built RKB Kustom Speed Motorcycles, designed and built by Rick Bray of Hanford, California. Rick and Luke have been lifelong friends, basically “brothers from different mothers,” as they like to characterize their working and professional relationship. Rick’s two motorcycles were very special to him, because of what they represented. The passing of his old friend, micro sprint race car driver Colby Solomon, inspired the “Solomon Special”. The second was Rick’s latest build called “Deal Breaker,” crafted during 2015, and at the time, the name had a special meaning for Rick. These two fabrications of rolling artwork were housed at Luke’s shop a few days for a photo shoot until disaster struck and everything was lost. During the recovery time, which stoked a lot of both Rick’s and Luke’s followers and fans, they decided as long as everyone was okay, they would concentrate on rebuilding, inspired by what appeared to be a hopeless and devastating loss and predicament. During the cleanup of Luke’s shop, countless friends and family came out, pitching in and gathering up the debris and helping restore the garage to working order. This support helped motivate Luke, rebuild, and like the phoenix, rise from the ashes and chard remains. Luke painstakingly sifted through the rubble, envisioning from the seemingly burned up junk, new and inspired pieces of art. Rick had a similar revelation from the events and has plans to create a motorcycle representing both bikes lost in the fire. On the weekend of August thirteenth and fourteenth, in a metal fabricating shop, just off the strip in Las Vegas, owned by the well-known metal fabricator Christian Sosa of Sosa Metal Works, I had the privilege of watching and listening to these three, Kool Hand Luke, Rick Bray, and Christian Sosa, collaborate and hold a metal fabrication class, taught by Christian. During the course of the workshop, Rick would give his tips and tricks for creating a motorcycle frame and would teach his skills to the lucky few attending the class. Other fabricators and fans in the industry donated items for auction, raising the funds necessary give to help Rick and Luke recover from the fire damage. 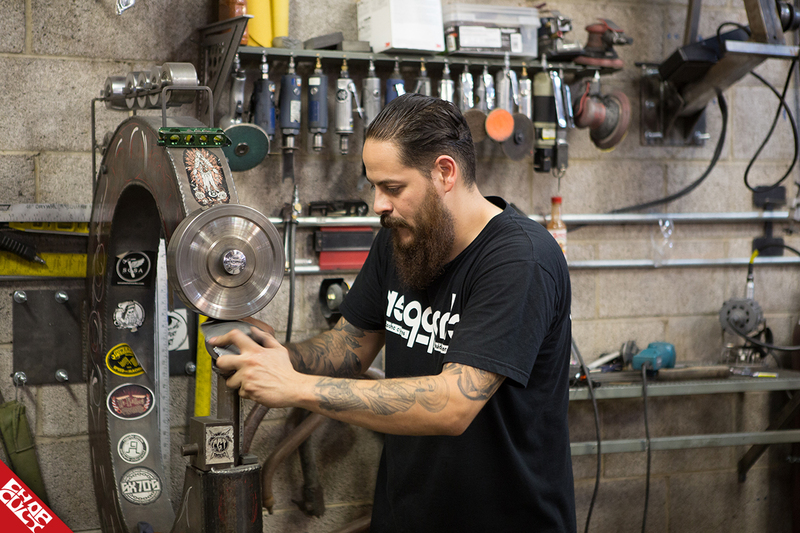 Spruce Street Fabrication, Speakeasy Original, Sosa Metal Works, as well as RKB Kustom Speed and Kool Hand Luke offered up pieces up for auction. 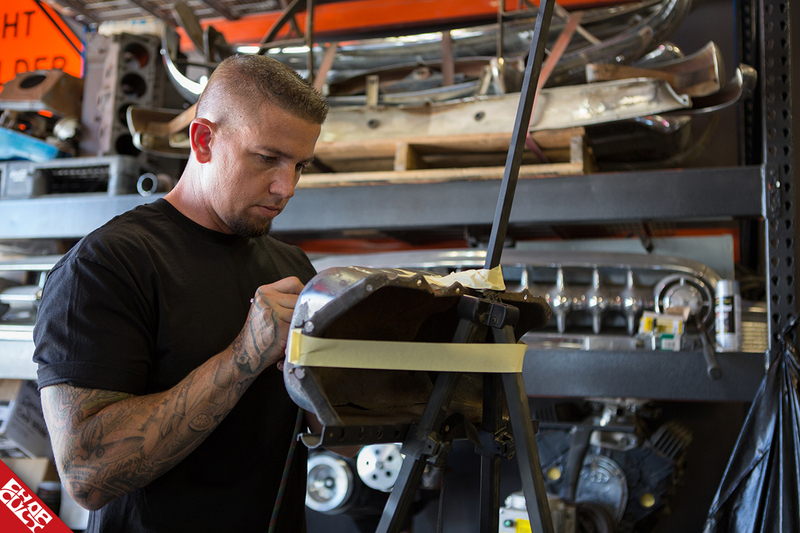 Christian did his normal metal bending and shaping process for gas tanks, and basically anything else on a motorcycle. He started the morning with a little “run down” on how to avoid leaning on the equipment, emphasizing the fact that “it can hurt if not shut off properly,” as everyone laughed in response. He told us about a previous student of his class, who smashed a finger using his shop hammer he built himself called “The Finger Banger.” Christian grabbed a piece of scrap metal from behind him, laying with a stack of others against the wall. He had an already-made dome piece and was showing the class how to replicate it from that piece of scrap. He took pieces of paper and covered the domed piece to get its dimensions, seeing how big a piece of metal he would need, then traced that paper on the scrap, cutting the metal circle out, and beginning the process. Christian would explain how using the hammer would shrink and mold the metal to what he wanted, and after a few passes, it started to take shape; getting closer and closer to that desired piece, until finally finished. 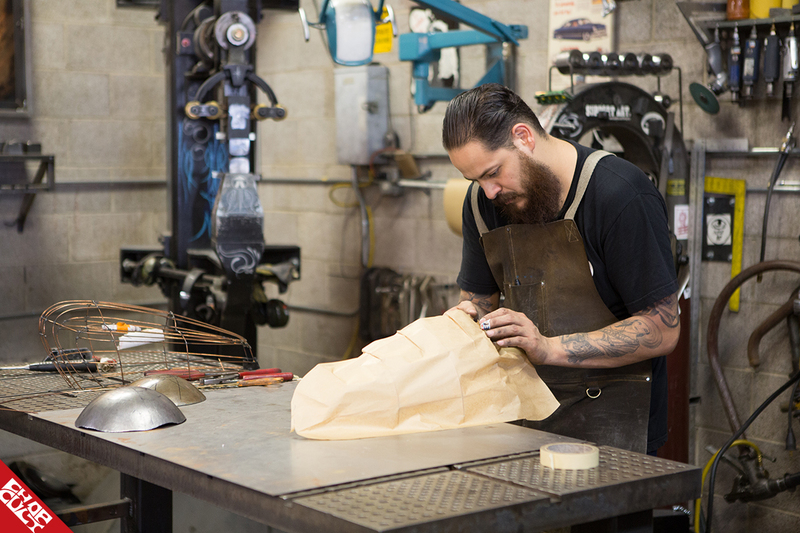 Christian then moved on to using copper, bending and welding it together to create a shell for a gas tank that he would cover in paper again to get the correct metal size needed to create that gas tank. He would do the same process when wanting to create any other fabricated pieces. Old wire shells hang above his work area, and never wanting to create the same piece twice, he had previous students’ shells hanging up around his shop as well. 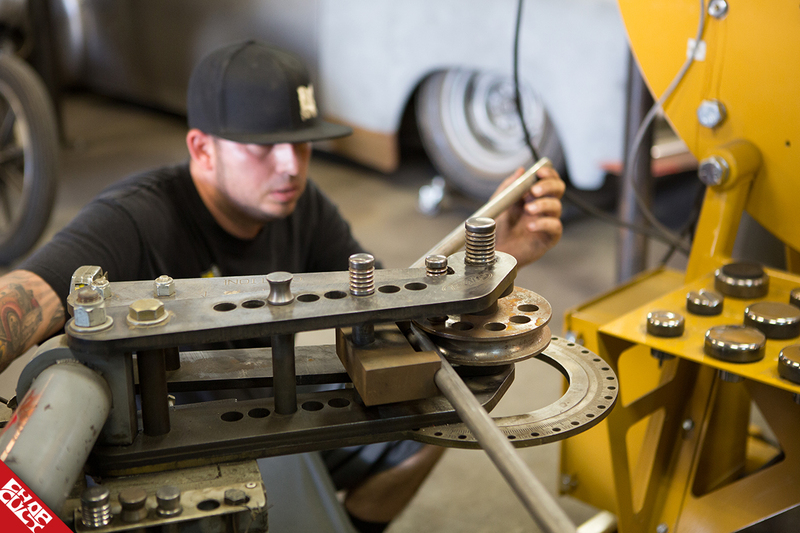 Christian was passing along some of his own standard secrets and tricks, even a couple other fabricators’ great ideas. Sorry, will have to get those secrets from Christian himself, after attending one of his classes. After a quick dinner (supplied and made by Christian’s lovely wife), everyone got back to learning. This time, it was Rick’s turn to teach attendees how he creates his motorcycle frames, using his custom-made jig. With some building and welding the frame started taking shape, and into the late hours of the evening Rick was answering questions and working to complete the process of building the frame, with Luke in the background, airbrushing pieces of artwork for Christian as a thank you for putting on this event. If you are in the Las Vegas area or what to schedule a class with Christian Sosa in the future contact him at @SosaMetalWorks on Instagram. You can find Kool Hand Luke on Instagram at @KoolHandLukeArt and Rick Bray at @RKBKustomSpeed. Good story on seeing people get it back together again.